Sainsbury's has reported a modest rise in sales over the Christmas period, matching analysts' expectations. The supermarket said like-for-like sales excluding fuel, which strip out the impact of new outlets, rose 3.7% in the 12 weeks to 29 December. Chief executive Justin King said consumer budgets were tight and the market would remain very competitive. Other retailers, including Marks and Spencer, have seen poor festive sales, raising fears of an economic downturn. Analysts had forecast that Britain's third-biggest food retailer would report sales growth of between 3.5% and 4% for the period. Sainsbury's said it served more than 300,000 customers per hour on 23 December, but warned that shoppers were tightening their belts. "Consumer budgets are clearly under pressure and we expect the market to continue to be very competitive," said Mr King. He said the chain's combination of good prices and quality products would allow Sainsbury's to weather the tougher trading conditions. Its Taste the Difference luxury brand and its Basics products were its best-selling ranges. Shares in Sainsbury's ended the day 6% higher at 388 pence. The picture for other supermarkets was mixed however. Tesco closed 0.6% lower at 416p, having earlier risen, while Morrisons added 0.4% to end at 308p. Rival Asda, owned by US retail giant Wal-Mart, said it enjoyed its best Christmas ever, but declined to give figures. It said strong performances in food and clothing had boosted sales. Data from research group TNS showed that Morrisons improved its standing in the grocery market over the Christmas period. It increased market share to 11.4% in the 12 weeks to 30 December, from 11% a year earlier. 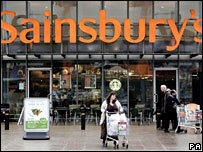 Sainsbury's market share remained unchanged at 16.4%. Retail shares fell sharply on Wednesday after Marks and Spencer reported a drop in sales during the final three months of 2007. They bounced back on Thursday on signs that trading might not have been as bad as first thought, following better sales reports from JD Sports and Liberty. Other retailers, including Next and Currys-owner DSG, have also reported falls in sales over the festive trading period.